The 1777 Fisher Barn has been reconstructed at the Home Lot and contains tools and other equipment, which illustrate Dover's agricultural history. The grounds include period gardens; the Parlor Garden, the Kitchen Garden, and the Fruitery. For years, members of the Dover Historical Society looked for a barn that could be raised on the Benjamin Caryl House lot and complete, again, the farm of the first minister. When it was learned that the Fisher Barn at 6 Centre Street was going to be demolished by a developer who had purchased the property, and that the barn was historically significant, the Society swung into action and put out a call for help. The Society and the Dover Historical Commission had decided to meet on July 28, 1999: the first joint meeting that anyone could remember. The Commission did not believe that the barn had enough historical significance to stop the demolition order under the town by-law. Since the Society was looking for a barn, the two groups moved to save the barn which was scheduled to be torn down on August 6th. The news of the move swept the town, and volunteers came out of the woodwork on that Saturday to save a barn filled with historical trash dating back to approximately th e same year as the Caryl House: 1777. The barn was taken apart systematically, and the tagged pieces were stored in the Park and Recreation garages on Whiting Road. Immediately after saving the Fisher structure, the Society formed a committee to raise the money to re-erect the Fisher Barn beside the Caryl House on Dedham Street - and to find someone to do the job. 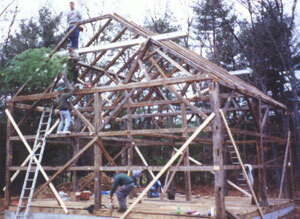 By the end of 2000, the 'Old Barn for a New Millenium' project was raising money and a contract had been signed with Early American Concepts to repair and rebuild the barn. 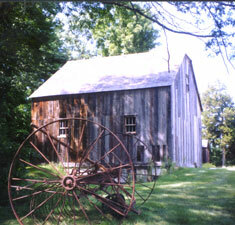 On February 14, 2001, the Dover Highway Department dug the foundation hole for the barn and reconstruction began. 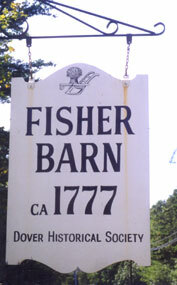 Some 20 months later, on Old Home Day October 6th, 2002, the Society handed the Fisher Barn over to the Town of Dover. Over the past year, the Society's agricultural tool collection has been transferred from the Sawin Museum and placed in exhibit. The project may be physically ended, but the process of making the barn a working historical artifact will be ongoing. A major task is the development of an educational unit that can become part of the Caryl program and involves the students of the Chickering School located across the street.